NBC has picked up two comedy pilots to series, one of which is based on the world of DC Comics. 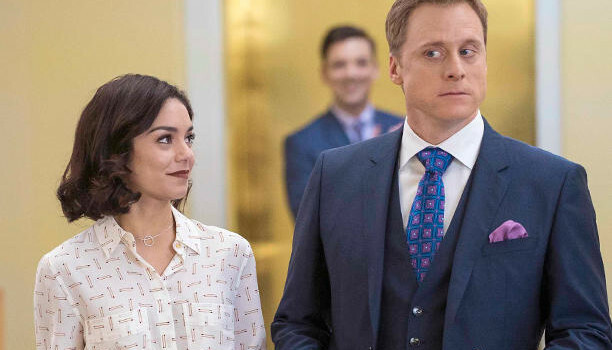 Powerless stars Vanessa Hudgens (High School Musical), Danny Pudi (Community), and Alan Tudyk (Firefly) star in a DC Comics-based comedy from A to Z’s Ben Queen. Vanessa Hudgens plays Emily, a spunky young insurance adjuster specializing in regular-people coverage against damage caused by the crime-fighting superheroes. It’s when she stands up to one of these larger-than-life figures (after an epic battle messes with her commute) that she accidentally becomes a cult “hero” in her own right … even if it’s just to her group of lovably quirky co-workers. Now, while she navigates her normal, everyday life against an explosive backdrop, Emily might just discover that being a hero doesn’t always require superpowers. Christina Kirk also stars, and the pilot will include Justice League Europe character Crimson Fox. Trial & Error, formerly known as The Trail, has an all-star cast including Nick D’Agosto, Steven Boyer, John Lithgow, Sherri Shepherd, Jayma Mays, and Krysta Rodriguez. Bright-eyed New York lawyer Josh Segal heads to a tiny Southern town for his first big case. His mission? To defend an eccentric, “rollercizing” poetry professor (John Lithgow) accused of the bizarre murder of his beloved wife. Settling into his makeshift office behind a taxidermy shop and meeting his quirky team of local misfits, Josh suspects that winning his first big case will not be easy, especially when his client is always making himself look guilty. More NBC pickups should be announced soon.